Not all Pallet trucks are created equally. A lot of manufacturers cut costs by using lighter materials and poor quality wheels to keep costs down. 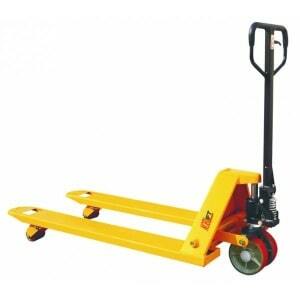 While they may be able to carry the same loads these cheaper pallet trucks do not last as long as the better quality ones we sell at Blyth Enterprises. Our Pallet trucks all have high quality polyurethane wheels to make them easier to handle and are constructed with thick durable steel! The standard fork width for a pallet truck is 685mm, but we can supply them with narrower forks for smaller pallets and tighter areas.